green tea: Exciting news on a rainy night! Exciting news on a rainy night! Eagle-eyed reader Takasuke spotted a familiar photo alongside a familiar name as he killed time on an Air Canada flight today. The picture I submitted to En Route Magazine's photo contest was published this month! That's my photo of the line of red umbrellas on the bottom right of the page. The online version is here. And here is the original photo. I don't quite understand why I sent that particular shot, because I think this one is far better. I must have still been jet lagged and foggy-headed. The moment I saw those umbrellas lined up on the main street in Koya-san, I already had this photo contest in mind. 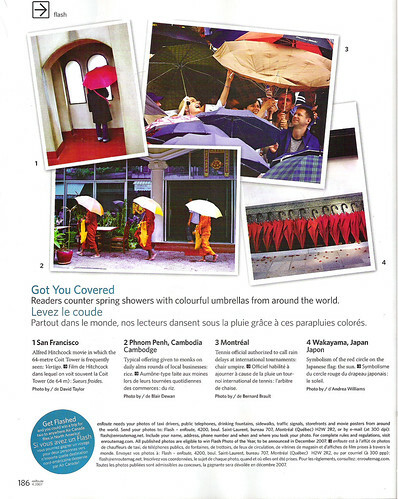 I had read En Route on my flight to Japan so I knew that 'umbrellas' was one of the themes they were seeking. The caption on my photo reads: Symbolism of the red circle on the Japanese flag: the sun. I did not write that. In reality, the umbrellas were there for tourists to borrow from a souvenir store, thereby creating an obligation for the tourists to buy something at that store when they returned the umbrellas. If mine is judged to be the best out of the whole year's worth of photos, I'll win flights for two to anywhere in North America. This is the second photo I've had published: one of my pictures was printed in Kansai Time Out a few years ago. This means a lot more to me, though. If anyone is flying Air Canada during April, could you please grab me a copy of the magazine? Congratulations! I'm flying BA tomorrow, sadly, but I'll ask my friend who's flying AC to try and pick up a copy. I think you can pick-up a copy of enRoute or two even "on the ground."